Finding good rhythm and tempo in your golf swing is a challenge that every golfer faces – and most never manage to conquer. Golf is a difficult game in part because it requires you to maintain a consistent tempo in your swing throughout a round that can last four hours or more. Additionally, you only get to hit a shot once every few minutes, so you have to maintain that tempo without swinging very often. Getting into a good rhythm on the driving range where you can hit ball after ball after ball is one thing, but doing it on the course is quite another. There are a number of swing trainers on the market designed to help you find that perfect tempo, but the Orange Whip just might be the best of all. The device itself is actually quite simple – it is a long shaft that is heavier than a standard club with an orange ball on one end. The shaft itself is softer than you would use with your regular clubs, so it ‘whips’ back and forth as you swing it. With the combination of extra weight on the end of the shaft and a softer shaft flex, the only way to make a good swing with this training aid is to use a smooth and even tempo. If you try to change directions too quickly while making your swing, you will notice right away. 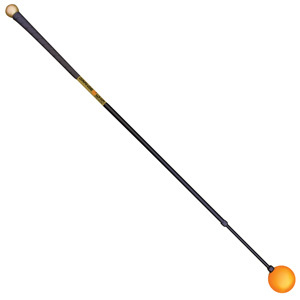 The Orange Whip makes it easy to make a long swing, helping your body to feel what it is like to make a full turn in both directions. In fact, if you use this training aid regularly as part of your practice sessions, you might find that you are quickly able to make a longer swing than before when you go back to your normal club. There are countless golf-specific muscles in your body that don’t get used very often in day to day life – using the Orange Whip regularly requires those muscles to jump into action so they are better prepared when you call on them on the course. The Orange Whip is offered in a variety of sizes so you can pick the one that will best suit you personally. If you are serious about your game and want to see results on the course in the near future, try making a schedule for yourself to train with the Orange Whip just a few minutes at a time on a regular basis. It shouldn’t take long for the lessons that you learn from this training aid to make their way into your game. Orange Whip Golf Swing Trainer Full Size - 47.5"
NEW Orange Whip Golf Strength & Tempo Swing Trainer Training Aid - 43"
Brand New Orange Whip Putter. The Perfect Training Putter.